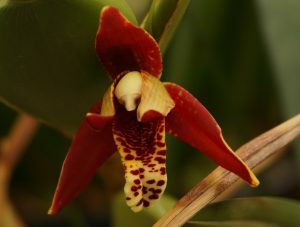 This warm growing species from Central America is locally called the coconut orchid as it produces a powerful fragrance which is unmistakably coconut. We have seen the species in the wild in Guatemala growing in drying lowland forest. We found it mostly on the trunk of trees or on lower branches where it has some shade. The plant has an ascending habit with a rhizome that grows bulbs progressively upwards which can make potting inconvenient and we grow plants mounted or in baskets in our Warm Americas section.